Three-wire cable or regular hookup wires. Any size wire #16 AWG or smaller may be used. On the PowerSwitch Tail side you will need to connect the wires to the terminal block. Connect the wires from the PowerSwitch Tail to the pins on the Arduino board. On the PowerSwitch Tail side you will need to connect the wires to the terminal block. Use a small screwdriver to access the screws from the top of the PowerSwitch Tail. Turn the screws CCW to open the terminal contacts. Strip about ¼-inch of insulation from the wires you can use a three-wire cable or three separate hookup wires (preferably red, black, and another color) and insert into the terminal block contacts through the holes on the side of the PowerSwitch Tail. Tighten the screws and verify the contacts firmly grip the wires. Plug the AC-power lamp or any electrical device (15amps @ 120vac) that you would like to control into the PowerSwitch Tail receptacle. 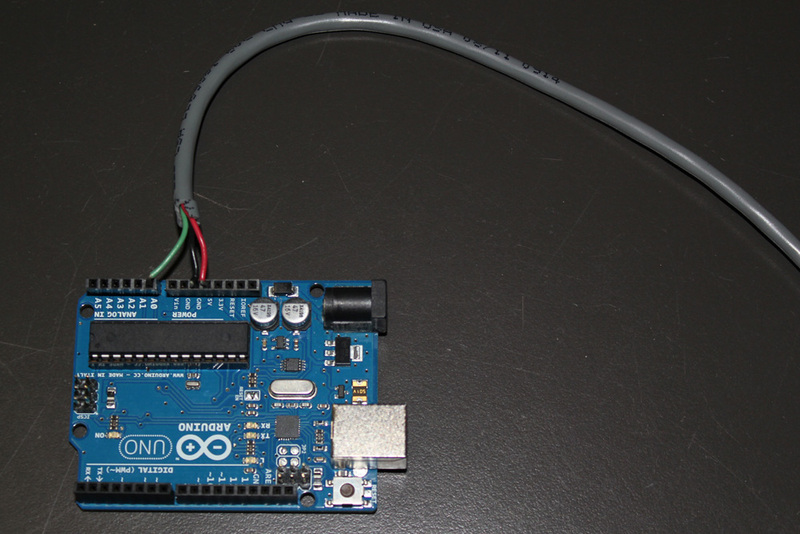 Assuming you have wired everything up correctly the PowerSwitch Tail and Arduino, you are ready to load the software onto the Arduino. If you have never used Arduino before, it may be worthwhile to read through some of their getting started resources before proceeding with this tutorial. If you already have Arduino installed and have successfully run one or two examples before, then this is nothing new - just copy and paste the code below into your Arduino window and press "upload". First, download the Spacebrew Processing Libary. 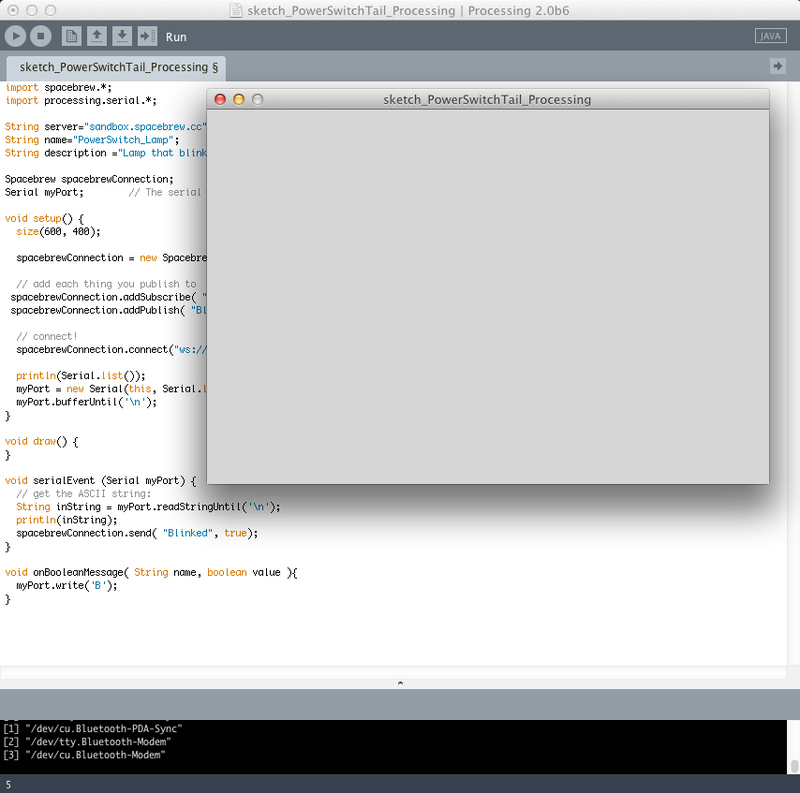 To install the Spacebrew Processing Library, refer to Step 3 of our Connect an Arduino Project to Spacebrew via Processing tutorial. Once you've successfully installed the Spacebrew Processing Library, it's time to create a Processing sketch to connect your Arduino to Spacebrew. Open a new sketch and paste the following code into the window. Run the sketch. //to determine which index your Arduino is at. If everything worked correctly, your Processing sketch should look like this and you should see your PowerSwitch Tail as a client on the public Spacebrew admin page. If everything worked correctly, you should see your PowerSwitch Tail as a client on the public Spacebrew admin page. (Note: if you do not see clients, publishers or subscribers on your admin page try it with another browser - we have mostly tested this with Chrome and have on occasion had issues with Safari and Firefox). By default, the name of the client node will be "PowerSwitch_Lamp" - this comes from the line 4 of the Processing code. Try changing the name of your client in your code and rerun the sketch. You should see the name change reflected in the admin. It’s best to choose a descriptive name so others have an idea of what your client does and if they’d like to subscribe or publish to it. Since the Power Switch Tail can receive boolean-type information, it has a BOOLEAN type node that appears under the SUBSCRIBERS column. Because this node controls the light on/off, it is labeled "blink" - this comes from line 12 of our Processing code), but you can change it to fit the AC electric device you have plugged to the Power Switch Tail receptacle. Now that we have the Switch Tail appearing as a SUBSCRIBER client in Spacebrew, create a PUBLISHER client that you can connect to and control the Power Switch Tail and the plugged lamp. Remember to give your client a unique name so you can easily identify your button on the Admin page. Remember to give your client a unique name so you can easily identify your button on the Admin page. You can add your unique name after the "name=" in the query string - press enter to re-load the page with your unique name. (Here we have given it the unique name "PowerSwitch-button"). If you go back to the Spacebrew admin page the button should now appear and it should look the second image at left. Click the BOOLEAN publisher node of the PwerSwitch-button, and then click the PowerSwitch_Lamp BOOLEAN subscriber to connect the two. Try clicking the button to see the lamp (or the electrical device you have plugged to the Power Switch Tail) turn ON/OFF.